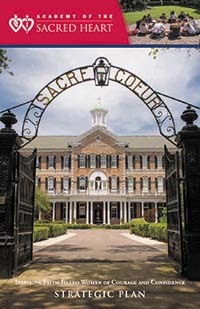 The Academy of the Sacred Heart is more than just a place, or even a school. For students, families, alumnae, and community partners, Sacred Heart is a rich experience of community and culture, a formidable landmark of faith and learning, a pathway for growth and an adventure to savor for a lifetime. Etched across our arched portico, our name announces our enduring message, “Sacré Coeur”—the universal loving heart of Jesus. Indescribable. Intangible. Felt. Beauty abounds at Sacred Heart. Students and faculty are surrounded by its graceful oak trees, wrap-around galleries, pristine grounds and tree-top views of New Orleans. But what matters most is the beauty one quickly discovers in the children at Sacred Heart—their happiness, their joy in inquiry, their quest to explore the world and their hearts moved with compassion for others. Open hearts. Open minds. Informed wills. Entering through these gates as infants and leaving as women, our students grow in confidence and become courageous Christ-centered leaders who change the world. Women of the Sacred Heart are difference-makers. Incisive. Inspired. Faith-filled. Our school is a community where girls grow through relationships, create lasting connections with others and benefit from a truly global network of over 150 Sacred Heart schools in 41 countries of the world. Critical consciousness. Global citizens. Friends. We are proud to present our strategic plan, “Inspiring Faith-filled Women of Courage and Confidence.” Many hours of thoughtful assessment and conversation has produced a visionary and exciting path for the next five years. Our plan is bold, forward-thinking, and realistic about its elegant three goals. In concert with the entire community, we believe the plan will galvanize our school into the future with a common understanding and purpose for the years ahead. We hope that it inspires and engages each one in a wide variety of ways for the sake of each child. Together, we look forward to continuing our great mission of forming and educating each child in God’s glorious image. With enthusiasm for the bright horizon ahead for Sacred Heart, our Board of Trustees is proud to present our strategic plan for the years ahead. The future can be shaped by choice or chance. The ASH Strategic Plan is a common sense approach that helps you manage the future rather than be managed by it. Strategic Plan enables the BOT, Headmistress, staff, colleagues, and others to make better decisions in relationships to one another. It helps an organization move form a reactive, crisis management mode into a proactive, anticipatory setting. I believe discernment. It allows an organization to be a catalyst—to steer, rather than simply drift along with the current. Allows us to make the best use of resources and identifies the need for expanded services. It provides justification for seeking new resources. Vehicle for bringing us into using planning as a way to give direction and to priority to our work. Essential part of quality management. At first sessions and each other one, we are carefully identifying, considering our capacities and environment. Planning is ADAPTABLE. It takes a long range approach but uses regular reviews and updates to check progress and make adjustments that are necessary to respond to the changing circumstances and to take advantage of new emerging opportunities. Strategic planning is planning for change. It stimulates activity and change rather than simply reacting to it. Strategic planning is visionary, but it is also realistic; it pictures a future that is desirable and achievable. It provides a structure for practical decision-making and for follow-through. Helps to shape and to guide what an organization becomes, what it does, and why it does it. It facilitates communication and participation. It fosters orderly, informed decision-making and successful implementation. It’s a long term investment, of sorts, with payoffs over time. It is not a quick fix. Strategic Plan answers four questions. How do we measure our progress (and answers what makes the organization unique)? The ASH Strategic Plan is longer than typical operational planning. It should look at least two years into the future; while most encompass four years. Five years is most common period of time used in planning, especially after a transition of leadership. The people who bear the responsibility for accomplishing a part of a Strategic Plan should participate in the development of that part of the plan. Why did we plan this way? Our Strategic Plan will galvanize us; it produces understanding and a common purpose. Obtains perspectives from multiple sources. It is realistic about goals and strategies for achieving them. It leads to resource decisions. Answers the question: How do we get there? Action Plans: Detailed descriptions of how strategies will be implemented on an operational basis. Resource Allocation: The determination of resources necessary to carry out strategies. Fulfillment: The people who bear the responsibility for accomplishing a part of the strategic plan should participate in the development of that part of the plan. Academy of the Sacred Heart has undergone an extensive renovation to its assembly hall and library, modernizing both and adding an art gallery, innovation lab and makerspace.